NEWS: SLIDERCUTS HAS MOVED LOCATION TO 176 HACKNEY ROAD! Over 20 aspirant barbers and entrepreneurs – from all over Europe – joined master barber SliderCuts for a first-of-its-kind afro hair masterclass, on Monday 25 September 2017. Hosted at the iconic Red Rooster in Shoreditch, Mark Maciver, the man behind SliderCuts, gave attendees the inside track on how to perfect the fade and create the most talked about men’s haircuts. He also equipped both advanced and novice barbers with the know-how on building and managing a successful barbering brand and business. In a hairdressing industry dominated by insight sessions on European hair, the SliderCuts Masterclass offered attendees a unique, educational glimpse into the world of afro barbering – from hair texture and curl direction to tips on the best clippers to use on afro hair. With sponsorship from Cantu, Kurl King and Red Rooster, attendees left armed with bags of knowledge and some of the leading products in men’s afro hair. 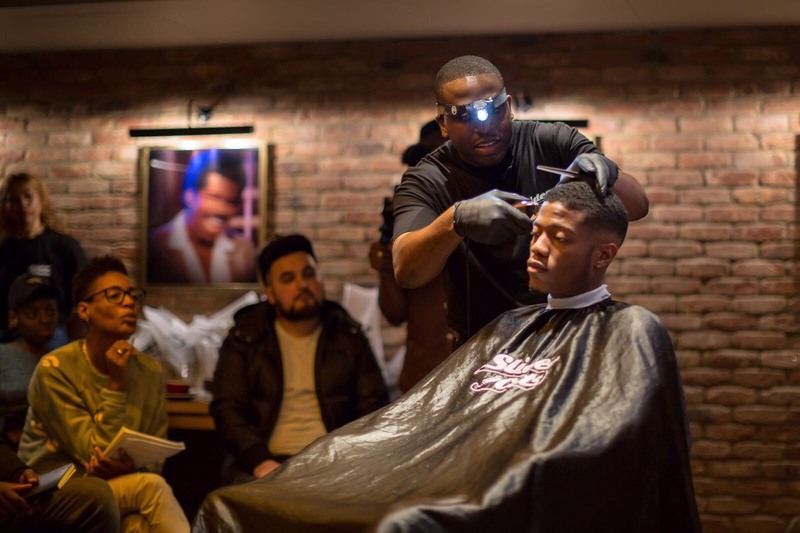 SliderCuts: The Masterclass is the first in a series of masterclass sessions, hosted by master barber SliderCuts, which explores the fundamentals of afro barbering.